Hi I'm Jon Reep. Comedian, Actor, & Metro Jethro. What is a Metro Jethro? If you were born and raised in a small town, but now either live or work in a big city. That's a Metro Jethro. We take the good parts of small town life and apply them or adapt them to big city life. For example, I drink martini's made with moonshine. They're delicious. We're not stupid rednecks, but some of our best friends are. We have an education. We're well-read necks! Not so much blue collar as blue scholar. We have manners, it's a type of etiquette I call red-netiquette. I use chopsticks to eat sushi, but if I drop it more than twice I'm using my fingers. I was born and raised in Hickory, NC. Which was the furniture capitol of the world, home to Winston-Cup champion Dale Jarrett, and the pig from Green Acres. Eva Gabor. Just kidding, she's from Hungary. I graduated from North Carolina State University 1997 with a bachelor of arts in Theater, Mass Communication, and Public & Personal communication. I started doing stand-up comedy at night while working as a production assistant for UNC-TV during the day. In 1998 I quit my job at UNC-TV and hit the road as a fulltime traveling comic, and that was the end of my life as a normal human being. Then in 2000, I moved to Los Angeles to try my hand at an acting career. As an actor I've played the pot smoking farmer "Raymus" from the hit movie Harold and Kumar escape from Guantanamo Bay, and the dim witted cop "Gerald Bob" from the ABC Sitcom Rodney. But you probably know me from Dodge Truck's popular ad campaign as the "Hemi guy". I'm known to millions as the redheaded hillbilly in the Dodge Ram commercials who leans out of a beat-up car and utters the now famous line: "That thing gotta Hemi? But before all that I was already one of the hardest working comics in America, selling out clubs and getting standing ovations at college after college across the country. As a comedian you may have seen me on season 5 of "Last Comic Standing" on NBC. I was the winner that year, thank you very much. 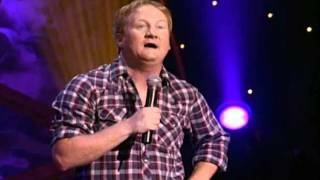 Maybe you've seen me on Comedy Central's "Premium Blend" or the half-hour special "Comedy Central Presents: Jon Reep". Possibly, you've seen me on TBS's "Pit Stop Comedy", NBC's "Late Friday" or CMT's "Comedy Club" & "Comedy stage." I was invited to perform at the Montreal "Just for Laughs" Festival in 1999 & 2004. I've also performed in the Las Vegas Comedy Festival in 2005 and the Bonaroo Music & Arts Festival 2006. My show is supersonic energy filled with non-stop characters and super clever writing. I'm on road all the time, so check out my schedule to see if I'm at a venue near you.